عندما تزور نابير, ستشعر أنك في بيتك في Scenic Hotel Te Pania الذي يقدم لك إقامة متميزة و خدمات عظيمة. يسهل الوصول إلى هذا الفندق ذو 4 نجوم من المطار، فهو يبعد عنه مسافة 10 km فقط. كما يمكن الوصول بسهولة إلى اوشين سبا, Pania of the Reef Statue, هاواكي باي. كما يقدم Scenic Hotel Te Pania الكثير من الخدمات لإغناء رحلتك في نابير. إن واي فاي مجاني في جميع الغرف, مكتب الاستقبال على مدار الساعة, مرافق مخصصة لذوي الاحتياجات الخاصة, تسجيل وصول/خروج سريع, صف السيارات هي جزء فقط من الخدمات التي تميز Scenic Hotel Te Pania عن باقي الفنادق في المدينة. تعكس غرف الفندق البالغ عددها 109 المنتشرة في 6 طوابق جواً من الدفء والألفة.خدمات عصرية مثل شاي مجاني, قهوة فورية مجانية, تلفزيون بشاشة مسطحة, اتصال لاسلكي بالإنترنت, اتصال لاسلكي بشبكة الإنترنت (مجاني) موجودة في بعض الغرف المختارة. كما أن مجموعة الخدمات الواسعة الموجودة في الفندق لضمان راحتك تترك لك الكثير من الخيارات لقضاء وقتك أثناء فترة إقامتك. استمتع بخدمات لا يعلى عليها وعنوان ذو اعتبار في Scenic Hotel Te Pania . يلزم توفر بطاقة سارية عند تسجيل الوصول وسيأخذ العقار نسخة من بطاقتك التي تحمل صورتك. It was awful to meet a straight face receptionist lady who told me she cannot find my booking. When I showed her the details from my agoda apps, she blankly told me, OH, YOU ARE NOT IN THE LIST. Gave me a second floor keys and told me to take the lift up. We drove, but the concierge wouldnt give a look at us, probably being Asians. We make a booking of 3 persons but we have only 2 towels, and when I want to go to reception to request, they will busy chatting amongst themselves. Worst. DO NOT GO IF YOU ARE ASIANS. 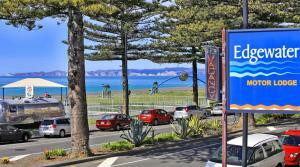 You will get the worst treatment you can ever get in Auckland, Napier. You can book other hotels or motels there. What an awesome stay, great view. Clean room. Close to almost everything. Best stay. The lady who checked me in was not friendly, no smile at all. Despite remarked for high floor, connecting room, none was arranged - instead probably got the worst rooms of the hotel on low floor and blocked view. Paid extra for the third guest but no additional amenities such as towels was prepared. Service below standard but overpriced. The Scenic Hotel was fantastic. We couldn’t fault it. Fantastic location on Esplanade so you can walk everywhere, to shops, cafes, restaurants, very helpful staff, all rooms have sea views, great p,ace would definitely return and recommend to fellow travellers. Manish who checked me in was very friendly, efficient, and helpful. Being single glazed and with the door loose fitting and no gasket, these rooms have no acoustic damping. Accordingly, traffic noise and noisy guests will disturb all but the really sound sleepers. The beds are 2 small doubles of basic quality, joined together and covered with a stained, feather mattress topper to mask the central edges. This gives a "hot" mattress with little underlying support. The views are ok but nothing to get excited about and they are not a strong selling point, the sea is visible from the second floor upwards above the conference centre across the road and in between the trees. The location is good. Overall worth considering if you are heavy sleepers but not otherwise. The tv in our first room didn't work so we changed rooms. I found that the door to the hall was inadequately sound proofed. Could hear people talking loud and clear, which also means anybody in the corridor could hear everything we said. Stayed here one night enrolee from Taupo to Wellington. Very nice hot, modern, interesting layout, good breakfast. Best sea view, Clean hotel, friendly staff and affordable price. We had a wonderful stay at Scenic Hotel Te Pania and would love to be there again! Staff very friendly and helpful. Great location. Pity the lower floors and restaurant are losing their view due to buildings works across the road. Restaurant overpriced for what they served. Driving from Rotorua to Wellington we were looking for an overnight stop and Napier was a great choice with its trendy cafes. The hotel is centrally located close to everything. Great staff particularly at reception. This was our second stay at the Scenic. It is a good hotel within easy walk to most places. Great views of the sea. Two things spoiled our stay for us. One was the constant banging of doors, the room doors are fitted with automatic door closers and hit hard when let go. The other door was the house keeping room which was just a few metres away from our room. The door was opening and closing from 7.20 am on a Sunday morning. The other thing was a 10 am checkout !!!. Only small things but they spoil an otherwise good experience. We would still go back there. Will go back again. Been stay there all the time. We found the staff at Scenic Hotel Te Pania to be very attentive and helpful. We came for our birthday's and was given a complimentary voucher for a drink each which was a nice touch. They also let us leave our car in their car park the next day while we did some sight seeing. Only negative feedback; The bed from afar looked so comfortable, like a big fluffy cloud - When we jumped in that night we found that under the sheets the had what felt/looked like a duvet inner. While the bed looked really cosy, it wasn't at all. Would stay again though and take this off. The view overlooking the beach was magnificent especially for the sunset. Friendly and helpful staff was also a plus point! Hotel is very close to city center. All rooms have a view of the sea. I will stay here again. Great hotel, very close to everything. Rooms are well appointed and have amazing sea views. Had a very pleasant meal in the restaurant, staff were very good. Would definitely return to this hotel. Beautiful views from spacious rooms. Hotel located 10 minutes walk from the town and from the Art Deco Centre, Napier is famous for but also next to the Wine Center for great tastings and discovery.Great place and friendly staff. Nice hotel for a weekend or a business trip. - Highly recommended!